Bought some fabric for my Halloween costume. My first post-marathon run. Not too shabby. Added a charm to my necklace! A beautiful day in downtown GR. I love the peacefulness of the Fish Ladder. It felt amazing to get back to running this week. I still need to "make a plan" and figure out what kind of training I'm going to do for the next few months, but the 8 miles I ran this week are at least a start. This week I've been enjoying the occasional adult beverage after work. (It's been a long, stressful week my friends.) I even got to enjoy a brew with a good friend after a nice walk to the brewpub on Saturday. I am most thankful for my buds, but the brews & booze have been appreciated this week too! 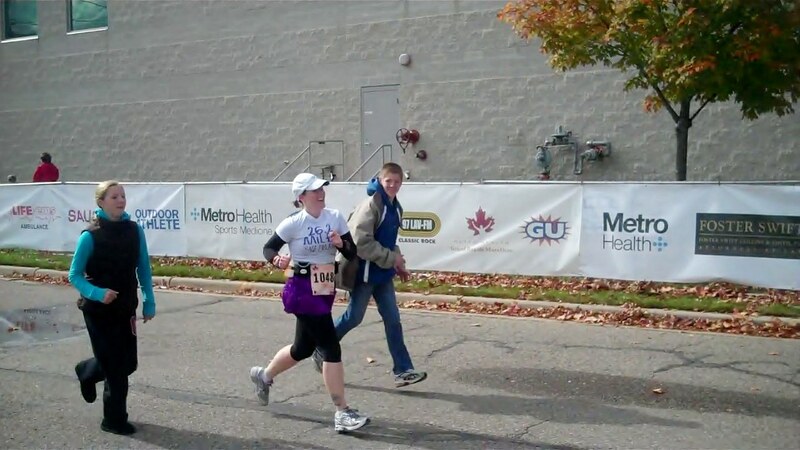 This week has been a bit of a let-down after finishing the Grand Rapids Marathon last Sunday. (You can read my race report and see video here. If you want to see my official race photos, you can check them out here.) I've been trying to lay low and make sure I'm fully recovered before I jump back into training. Anyhoo....here's a peek at my week. Loving my Grand Rapids Marathon bling! The van got some new bling, too! A much needed trip to the chiropractor. First post-marathon workout with my Chocolate Milk Refuel swag. This just in - marathons hurt your abs too, even if you don't realize it at first. Today was the "Run the Hood" virtual 5k and 10k hosted by The Sisterhood of the Shrinking Jeans. I didn't sign up (not knowing what condition I'd be in this week) but decided to walk it as a "bandit" with Mel. We had a great time and finished our walk at Bell's Brewery. Win-Win! Today was the first concert of the 2011-2012 season for the concert band M performs with. They put on a great show today. 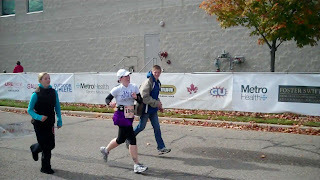 I had some rough emotions last week, coming off the marathon and coupled with a very stressful work week. Do you ever have the blues after finishing a major race? How do you cope? 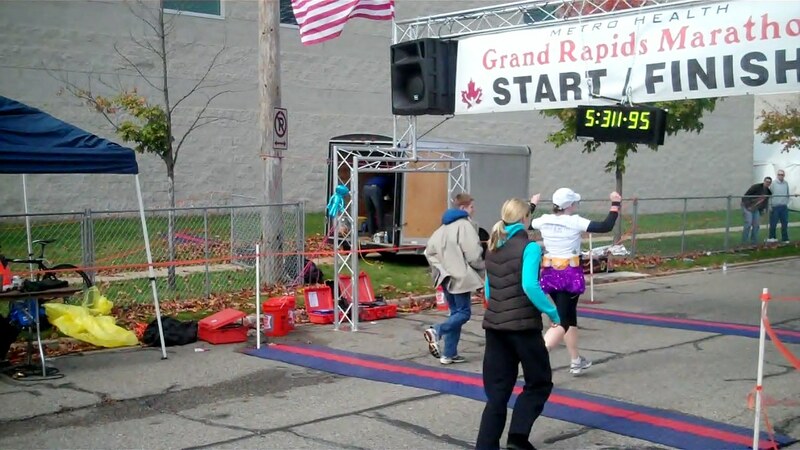 For the past 4 months or so, I've been preparing to tackle my toughest run to date: the Grand Rapids Marathon. I completed that goal this past Sunday and could not be more proud of myself. You can read my race report here (lots of pictures & even some video!). I even feel pretty much back to "normal" physically (mentally is a subject for another post). I've talked a lot about how my online community of friends (along with my friends and family here) have been so incredibly supportive of me in this journey. During the race, I had my phone with me but had turned off the notifications for Twitter and Facebook. I figured a few people would be encouraging me as I ran and I didn't want it to distract me from the task at hand, which was "left foot, right foot, lather, rinse, repeat". I tweeted a couple times late in the race and saw lots of mentions but I didn't read them at the time. When I finished the race and sent a tweet that I was finished and officially a marathoner, I was shocked to see how many mentions I had. The awesomeness meter is about to go off the scale! And it's all YOUR FAULT!! You're ready. You've trained. You're totally up for this! See you at Finish Line. 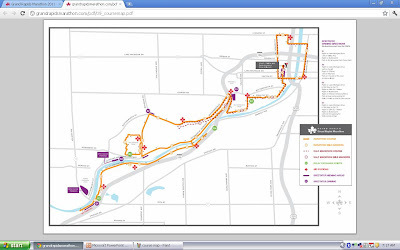 Race Director, Metro Health Grand Rapids Marathon"
Watch twitter Sunday morning - I've signed up for the on-course tweets of my progress. Don't be surprised if I don't tweet back until I'm finished though. The weather looks a bit dicey, so my phone will probably stay safely sealed in a ziplock until after the race. Who know, though. I might feel compelled to tweet a photo or two. You know me. I loves me some twitter! Thank you again to everyone who has helped me get this far. 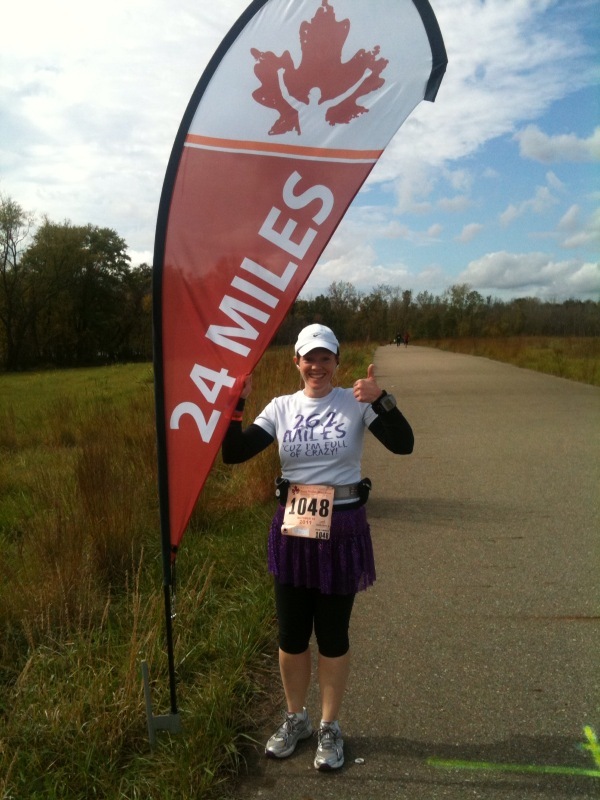 Next time I post, I'll be a Marathoner! Super big puffy hearts love to everyone who entered my giveaway for a My Race Ragz custom tech shirt. I absolutely love mine and can't wait to sport it crossing the finish line of the Grand Rapids Marathon on Sunday!!! I know I said I'd announce the winner tomorrow, but I just couldn't wait. 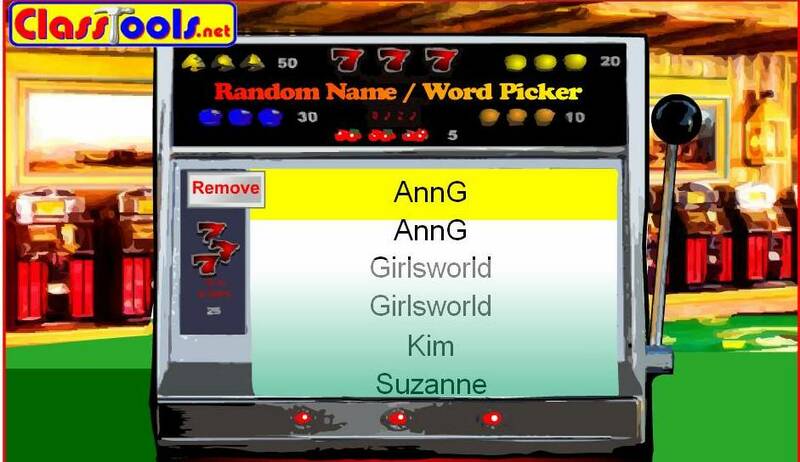 Ann G from She's Gonna Blow!!!!! I love this woman so much - she is doing some pretty awesome things right now, namely training to walk the Susan G. Komen 3-Day for a Cure! You really should go check out her blog and if your heart so moves you, consider donating to her walk. So, Ann, I know how to get ahold of you on Twitter but if you could also send me your email that would be fantabulous! Congratulations and I can't wait to see what kind of shirt you design!!!! Terrific True Confessions Tuesday: Last Day to Enter! Today is the last day to enter my giveaway for a custom tech shirt from My Race Ragz. You have until 9:00 PM EST, so click that link and ENTER! I'll be running in my shirt on Sunday - what will you wear for your next race? Since this is True Confession day, I'm going to confess that I need to not step on the scale until after the marathon. I'm thinking at least a week after the marathon. Yesterday morning the bi*ch made me want to cry and I am so much more than a number on a piece of machinery! I am a 41 year old woman who is going to be running her first marathon in 5 days, dammit! I've been training my @$$ off since June (well, apparently not LITERALLY) and I should be thrilled with what my body has been capable of. Gaining a couple pounds during training and taper shouldn't make me freak out. Now...if they aren't gone within a month AFTER the marathon, then we've got a problem. Also, I'd like to confess I wish it was Sunday around 1:30 pm so I could stop feeling like I might barf or cry at any given moment. If you see me in Target this week sobbing, just ignore me. Yesterday's edition of the Grand Rapids Marathon Newsletter contained some very good advice from marathon director Don Kern. You're ready. You've prepared. You've trained. And now, it's time for the fun. Feel the energy from the people around you. Find someone wearing a staff jacket and give them a hug. It's your day now. Enjoy everything about it. Everybody here loves you. We're all here to help. And YOU? You're gonna be awesome out there." Yep - waterworks. I'm trying, Don! I'm trying to "re-freakin'-lax". We are now into the SINGLE DIGIT countdown to the Grand Rapids Marathon!!!! 9 days, baby! A few random thoughts about "taper madness"
You become completely germ-obsessed: since I've been sick for the past almost 2 weeks now, apparently I wasn't germ-obsessed enough. You become a self-proclaimed meteorologist: I seriously need to stay away from all sites weather-related. As a bonus, the long-term forecast for Sunday, October 16th is partly cloudy with a high of 58* and a low of 44*. Winds at 11 mph and only a 20% chance of precipitation. Now, understand this is Michigan and as they say, "If you don't like the weather, wait 5 minutes and it will change" so who freaking knows what it will REALLY be like race morning. You feel every little twinge and sore spot on your body. Today, it's my left ankle, right knee, both calves, and my the breathing issues are coming back (which makes me think the breathing crap is TOTALLY anxiety). You make 52 trips to the running store in 24 hours: side bonus - you are supporting the local economy and this will also help you keep your Foursquare "mayor" status. You question every missed workout and every workout that didn't go as planned. 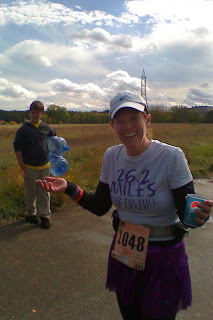 Then, you realize they were all learning experiences and you write a blog post about all the miles you've banked while training for this marathon. You check and re-check every piece of gear you own, setting out your race-day outfit a full week in advance. Speaking of race-day outfits, have you entered my giveaway for a custom-designed tech shirt from My Race Ragz? So, fellow victims of Taper Madness. Did I miss anything? What do you freak out about in the couple weeks leading up to a big race?